On 30 July, 2009 by Ciara Feely	Comments (0), leave your own! Radisson SAS have rebranded and are now Radisson Blu! I have rates negotiated with all the hotels in Ireland. There are some fantastic hotels in the brand, I consistently get great feedback from clients who use the Radisson Blu Royal in Dublin City Centre. It is a great Dublin Conference Hotel and I find the team excellent to work with. With the below delegate rates there are no hidden surprises. I request most quotes now in day delegate format so that you know exactly how much an event is going to cost. My clients prefer it for budget reasons and it is much easier to compare costs across the board too. Of course, using a venue finder, I do all the leg work in comparing prices, and putting it all in the one easy to read format. I also know where to negotiate with hotels and where the most room for negotiation is. Check out the conference and meeting deals below – they all help in arranging a Conference or Event on a shoe string budget! Minimum number apply in all hotels. Minimum number of 10 delegates alpply in all hotels. 11 dedicated meetings and events suites that can accommodate up to 300 people! 15 meeting rooms including boardrooms and a video conferencing suite, which can host a small meeting for 12, a large theatre-style event for 400 or a sit-down dinner for 300! 9 meeting rooms housed in the elegant Ditchley House and the impressive ballroom for up to 450 delegates! 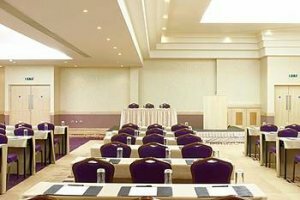 11 meeting rooms, Ballincar Boardroom with a capacity of 18 and Benbulben Ballroom with a capacity of 950, theatre style!